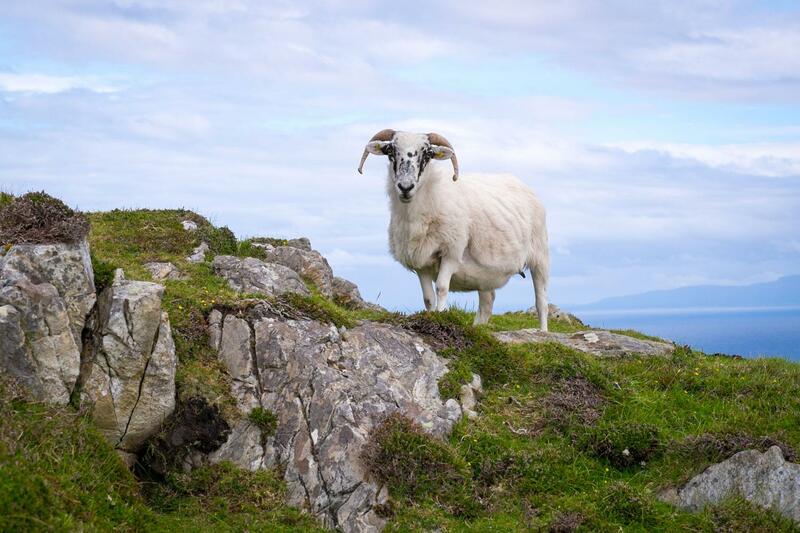 Sheep’s Head comes from the ancient Gaelic, “Muintir Bháire”, the people of Bháire, an ancient tribe. 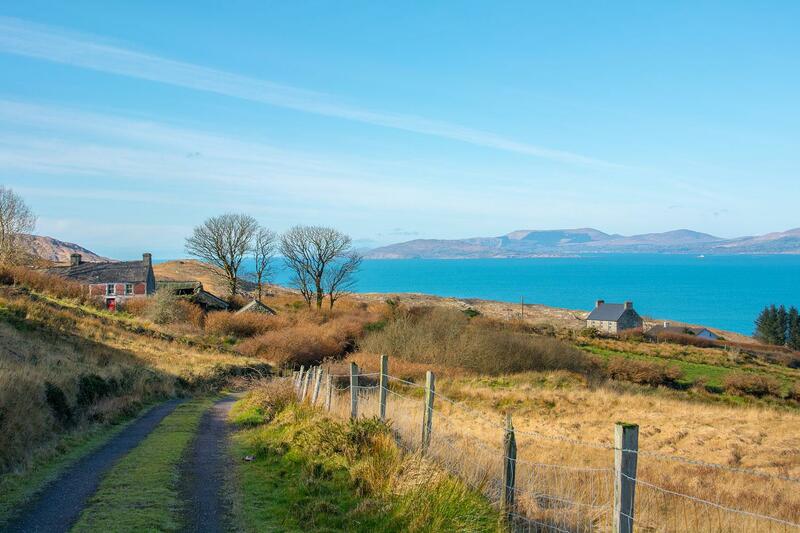 Relax as you breathe in the fresh salty air on one of your daily walks and discover the quietest and smallest of the major southwestern peninsulas of Ireland. Uncover evidence of this area’s rich history as you follow trails past old burial grounds and standing stones. 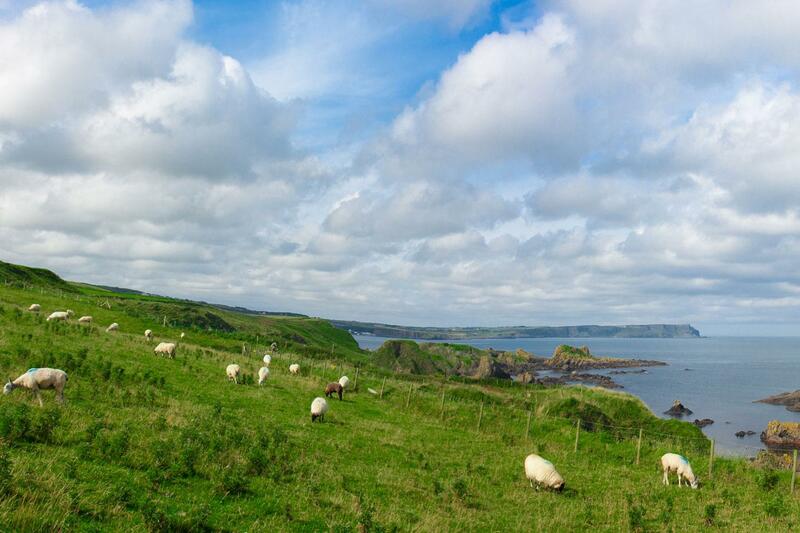 Relish the fantastic flavours of the Sheep’s Head Way as you travel through these stunning landscapes that inspire the artisan’s who produce Durrus cheese, fresh wild-caught smoked fish, Clonakilty Chocolate and locally-brewed beers. 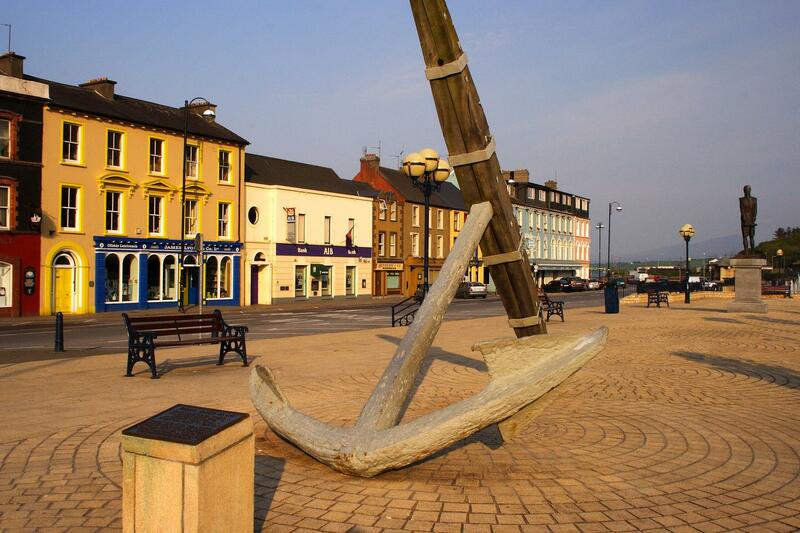 The historic market town of Bantry is set at the head of Bantry Bay and on Ireland’s most south west point. You can take a bus from Cork to Bantry which takes approximately 1H50. Here you can enjoy freshly caught Bantry Bay mussels in one of the many fine dining restaurants. Also, time-permitting, do not miss a visit to Bantry House & Gardens. Settle into your cosy B&B before embarking on your first walk tomorrow onto the unspoilt landscapes of the Sheep’s Head Peninsula in West Cork. 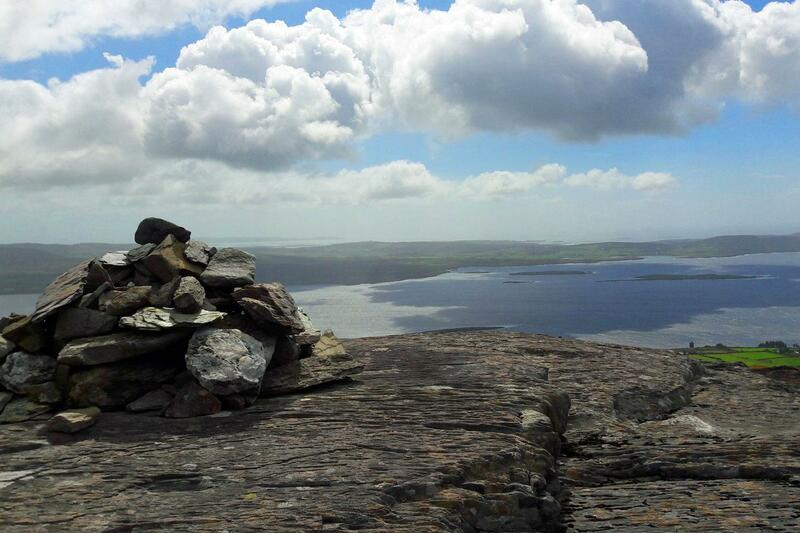 After a full Irish breakfast to fortify you for today’s walk, head directly out of Bantry along the coast road with views of Whiddy Island to your right and then turn inland to the first of the hills and moorland. Once you reach the hills you will walk along the stunning ridge with outstanding views before dropping down to your accommodation in Glanlough or Gerahies. You will be warmly welcomed in your B&B. Since there are no eating establishments here and depending on where you stay, you will either take a transfer to Akahista for dinner (10 minutes away) or eat a delicious dinner at your B&B. On this narrow peninsula you are never too far from the sea and today’s walk takes you inland from the coast and along the ridge. Views over both the peninsula and the sea are stunning and make sure to look out for sightings of dolphins and whales over Bantry Bay. Pass close to Seefin Mountain before heading across the peninsula to Kilcrohane, a small yet thriving community, with 2 pubs and just one shop. It is one of Europe’s most westerly villages and here you will find treasures from local craftspeople and artisan food makers. A short transfer brings you to The Cove and the beginning of today’s walk on the north west part of the peninsula. First make your way along a coastal path passing secluded coves and the ruins of a famine hamlet known locally as the “Crimea”, until you reach the junction of the Cahergal Loop. Follow this trail across a narrow part of the peninsula until you reach part of the Caher Loop on the south coast. Pass a holy well and old burial grounds as you walk. This loop is then linked with the Funeral Path by the official Sheep’s Head Way and takes you past the ruins of the old stone Kilcrohane Church. Tonight you can either eat at your accommodation or at a restaurant/pub in the village. 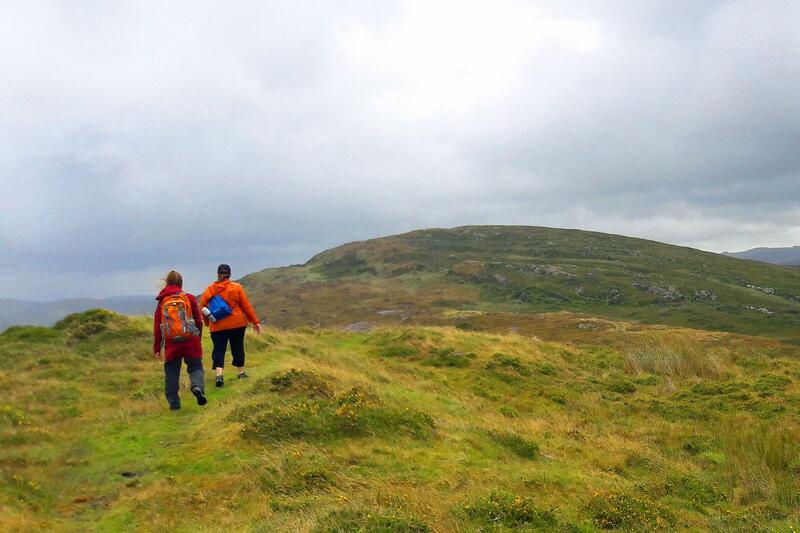 Walk directly out of Kilcrohane, firstly heading east until you reach the Seefin Loop which will take you to the Sheep’s Head peninsula’s highest point, 300 metres above sea level. On the heathery Seefin ridge you may well be reminded of the wild moors of Heathcliff’s Yorkshire, as it is remote and barren, yet so beautiful. 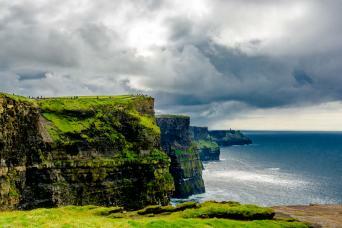 These natural landscapes are certainly some of the best in Ireland. The trail brings you into Akahista. Here there is a pub overlooking the harbour where you may want to stop for a pint of Guinness and a bite to eat before heading west back to Kilcrohane from where there are great views over Dunmanus Bay. 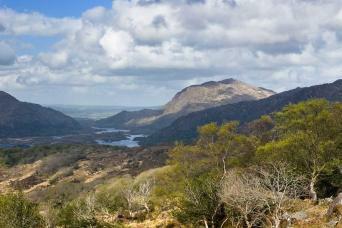 After being dropped off in the village of Durrus (a 20 minute drive from Kilcrohane) the walking route follows Four Mile Water Valley before climbing through the forest to ascend Barr na Gaoithe, the Top of the Wind. 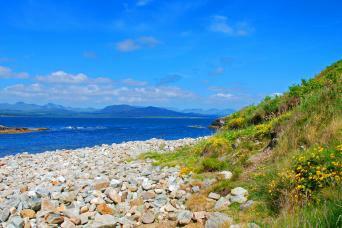 From here there are amazing views over the majestic town of Bantry and Bantry Bay. Now meander back down on small country roads into the town, your start and finish point for this tour. There are local buses from Bantry direct to Cork, where you may board a flight from the airport and journey onwards. The accommodations on this tour are hand-picked B&B’s and guest houses. All offer a particularly warm welcome to walkers, traditional hospitality and delicious full or Irish breakfasts. Please be aware that there are 2 accommodations on Day 2 that we will use, one is in Glanlough and the other in Gerahies. Both accommodations are between 1 and 2km from the end of the day’s walk. If you stay in Gerahies this will also add about 1.3km to the next day’s walk. Please be aware of these details when calculating your daily walking distances. A hearty breakfast is included each morning. Lunch and dinner are not included so you are free to choose from the available options. Most of your accommodations will more than happy to provide a packed lunch on request and this can be booked on arrival. For dinner there are either nearby pubs and restaurants in each location or the B&B will provide dinners. In Glanlough the B&B will take you to the restaurant in Akahista and will also pick you up afterwards. The Mill B&B is located about 1km from the very centre of Bantry. It is run by the lovely Tosca and her husband who immediately offer a cup of tea upon arrival in the sunny conservatory. 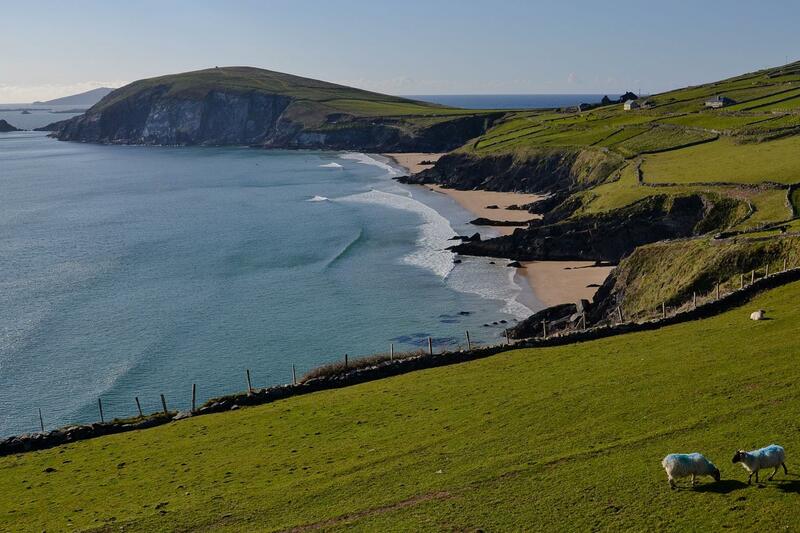 Seamount Farm offers peace and tranquillity with stunning West Cork scenery on its doorstep. Irish breakfasts here are first class with lots of choice and the rooms are very comfortable. This B&B is a lovely 170 year old Irish farmhouse set in 1 acre of beautifully landscaped gardens and and it offers a warm, friendly welcome and well-appointed bedrooms with large ensuites. This family-run B&B will welcome you with open arms. It has a great location in the heart of the village with comfortable rooms and a very appetizing full-cooked breakfast. This walking tour is available between April and October. You can start on any date subject to availability. You will find up to date availability on our website. The walk is very popular so it is best to book as far in advance as you are able to. This itinerary is graded moderate and is suitable for regular walkers. When walking on the ridge along the peninsula this is reminiscent of English/Scottish moorland so can be windswept on the tops. There will be elevation gains and losses to get up to the ridge but no more than 450m and on most days just 350m of gain. You will be walking along green roads (old cattle drover’s roads), pathways, forestry tracks and minor tarmac roads. During rainy weather some of the trails can be very muddy, boggy and waterlogged, so be prepared to get your boots wet and wear very good quality walking and waterproof boots. Wearing gaiters is also a good option. 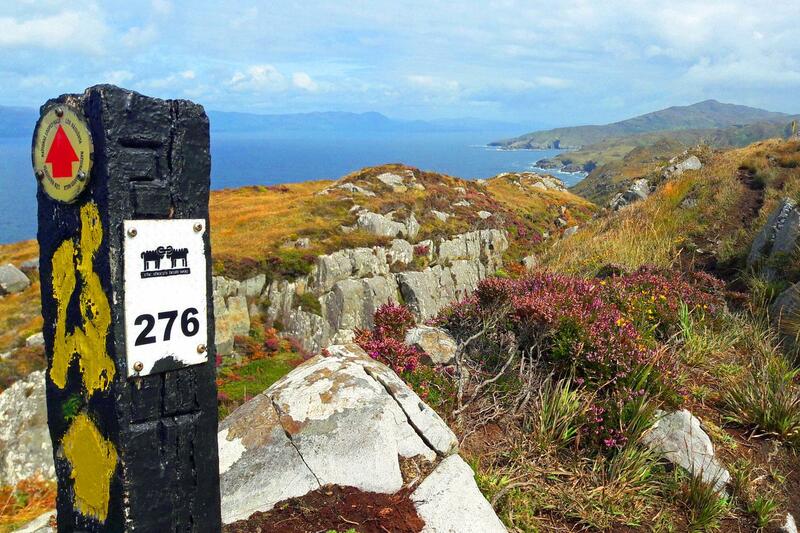 As there are no “public rights of way” in Ireland these itineraries do involve road walking. However the roads are generally very quiet and pleasant to walk on with great views with always a wave from the locals. At times though you may have to look out for traffic. This route is way-marked but at times the way marking will be a bit intermittent and sometimes we may follow a different route to avoid a busy road, for example. Detailed route notes and GPS data will be provided for you via the Macs Adventure App. Further information will be provided upon receipt of your booking. The distances and descents / ascents are approximations of the recommended routes. Please be prepared by packing all necesssary items, for example, proper rain gear (jacket and pants), sun hat and sunscreen. Your information pack has a detailed equipment list which includes standard walking/ cycling gear such as good walking boots or shoes, warm and waterproof clothes for the cooler months and lightweight clothing for summer, and a day pack. The closest international airport is Cork Airport. This airport is served by a few different airlines such as Ryanair and Aer Lingus from cities such as London, Manchester, Glasgow, Munich, Zurich and Amsterdam. When you arrive you can take a #266 bus from the airport to Cork Parnell Bus Station. Buses from the airport run approximately every half an hour. From Cork Parnell Bus Station you can catch a bus to Bantry, there are about 5 buses departing per day and the journey takes about 2H. It is also possible to fly into Dublin and take an Aircoach direct to Cork either from the airport or from Dublin city centre. which takes about 3H30. You can then do as described above and take a bus from Cork to Bantry. You can also fly into Shannon Airport, then take a bus to Cork from here. Buses run approximately every hour and take about 2H35. Then take a bus from Cork to Bantry. A useful website when deciding on your travel plans is Bus Eireann. 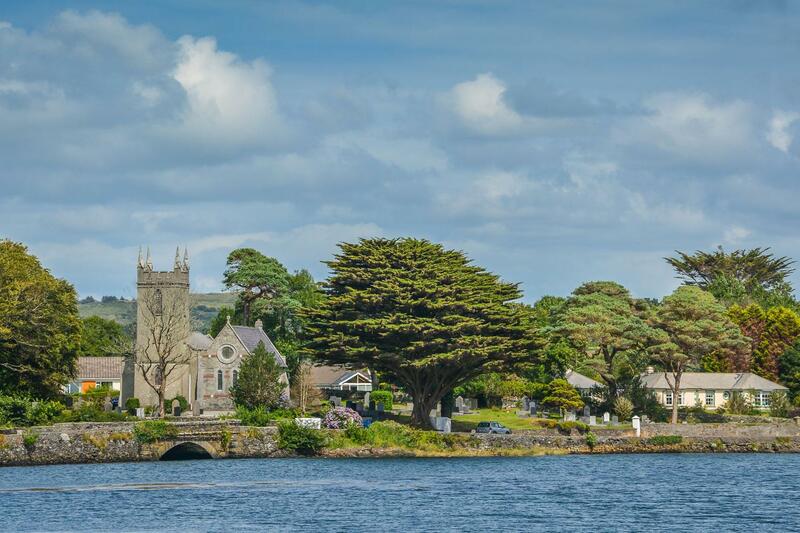 We suggest you book as soon as your plans are finalised as this area of Ireland is extremely popular from May all the way through to October. You will find up to date availability on our website and we will always try and accommodate your plans. Very strenuous! I would advertise this trip for AVID hikers not regular walkers! That being said my husband and I did it! We're both 66 and found it took us twice as long to complete the days hike! Be advised of the high and steep step ups and the changeable weather conditions! Rain gear, waterproof boots and walking pole a must!! Very impressed with the Macs App for the GPS maps and emergency number! Super glad we didn't have to call for help! Day 1: Arrive Bantry and overnight. Day 2: Bantry to Glanlough/Gerahies, 14km. Day 3: Glanlough/Gerahies to Kilcrohane, 13km. Day 4: The Cove to Kilcrohane, 13 km. Day 5: Kilcrohane Loop via Seefin Mountain, 15km. 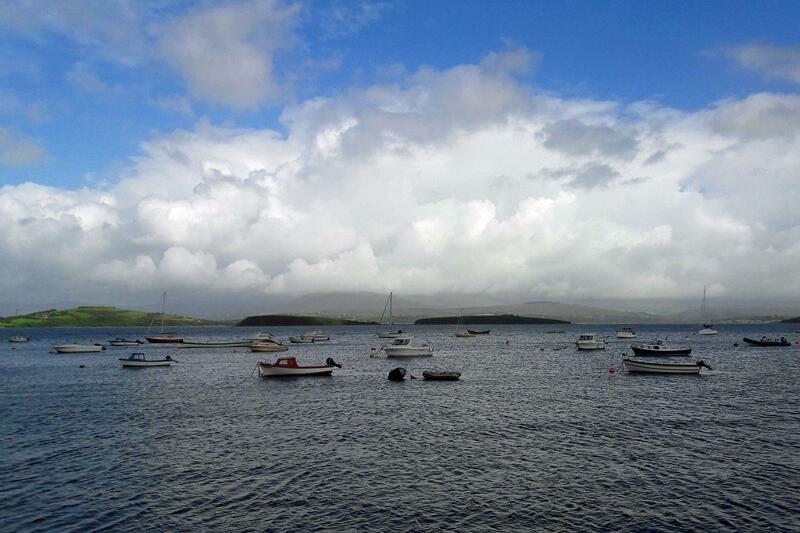 Day 6: Transfer to Durrus, walk to Bantry, 19km. This area has managed to maintain its natural charm since it is quite remote from any large towns & cities. Here you will truly feel that you might be the only tourist as it is not as busy as some of the other Irish “Ways”. However this is its advantage, especially if you also enjoy unspoilt scenery, history, cosy B&B’s and the very warm welcome of locals. The walking is rated moderate, but the distances are fairly short, so as long as you are a regular walker you are sure to enjoy this adventure to the max!